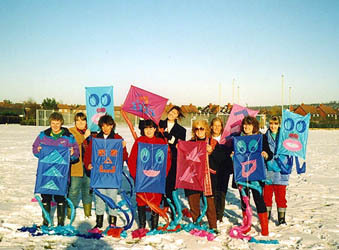 To see photos of club kitemaking workshops click on the gallery button. VIDEO A short video to introduce newcomers to the many varied aspects of kite flying. TALK A brief history of kites and how they fly, illustrated by a collection of our own kites. MAKING The making of a simple kite from easily available materials like plastic bags, paper, straws and skewers, etc. In the more advanced workshops we can build a sewn kite using ripstop nylon and other modern materials. These can either be from traditional designs or one of the kites designed by ourselves. Kits can be provided. FLYING At some point during the workshop, location and weather permitting, we set aside time for flying both the creations of the day and also some of the kites we have brought along. SUMMARY Alongside the structured events we also provide a selection of videos and books to look at, as well as national and local kitegroup details, kite festival dates and information. We also offer friendly advice on any kite related projects. COSTINGS Please contact us for further information. 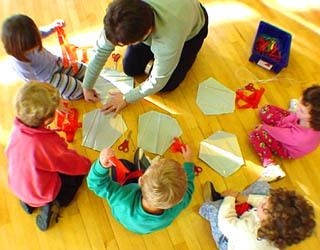 BANNER MAKING WORKSHOPS AND WINDSOCK MAKING WORKSHOPS ARE ALSO AVAILABLE.